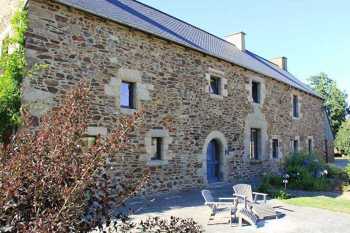 A beautiful restored manor house with a modern and bright interior that has retained many beautiful authentic features., Located on 8845 m2 of landscaped and planted land, protected by hedgerows and surrounded by pastures , Also offers a beautiful stone longhouse currently converted into a games and relaxation area with bar, snooker and outdoor jacuzzi for 8 people! The house offers quality services, very well maintained and presented, Currently a second home for its owners who also offers on the seasonal rental market .. The housing in the main house includes the ground floor; an imposing entrance hall with cloakroom and toilet, living room with fireplace, a fitted kitchen and luxury with dining area, utility room and a separate pantry and a beautiful living room with stone fireplace and polished concrete floor. On the first floor, a magnificent landing leads to four double bedrooms, two with shower room, a family bathroom and a separate toilet. The second floor offers another exceptional double room. A large stone outbuilding has been converted into an additional leisure area including a bar / party area and a fully equipped gym. There are other outbuildings that offer additional potential. The property is surrounded by its own grounds and includes an outdoor dining area, BBQ facilities and a hot tub / swimspa. A truly exceptional property. two with shower room, a family bathroom and a separate toilet. The second floor offers another exceptional double room. A large stone outbuilding has been converted into an additional leisure area including a bar / party area and a fully equipped gym. There are other outbuildings that offer additional potential. The property is surrounded by its own grounds and includes an outdoor dining area, BBQ facilities and a hot tub / swimspa. A truly exceptional property. two with shower room, a family bathroom and a separate toilet. The second floor offers another exceptional double room. A large stone outbuilding has been converted into an additional leisure area including a bar / party area and a fully equipped gym. There are other outbuildings that offer additional potential. The property is surrounded by its own grounds and includes an outdoor dining area, BBQ facilities and a hot tub / swimspa. A truly exceptional property. other outbuildings that offer additional potential. The property is surrounded by its own grounds and includes an outdoor dining area, BBQ facilities and a hot tub / swimspa. A truly exceptional property. other outbuildings that offer additional potential. The property is surrounded by its own grounds and includes an outdoor dining area, BBQ facilities and a hot tub / swimspa. A truly exceptional property. This type of property is rare on the market - A beautiful restored manor house with a modern and bright interior that has retained many beautiful authentic features., Located on 8845 m2 of landscaped and planted land, protected by hedgerows and surrounded by pastures , Also offers a beautiful stone longhouse currently converted into a games and relaxation area with bar, snooker and outdoor jacuzzi for 8 people! The house offers quality services, very well maintained and presented, Currently a second home for its owners who also offers on the seasonal rental market .. The housing in the main house includes the ground floor; an imposing entrance hall with cloakroom and toilet, living room with fireplace, a fitted kitchen and luxury with dining area, utility room and a separate pantry and a beautiful living room with stone fireplace and polished concrete floor. On the first floor, a magnificent landing leads to four double bedrooms, two with shower room, a family bathroom and a separate toilet. The second floor offers another exceptional double room. A large stone outbuilding has been converted into an additional leisure area including a bar / party area and a fully equipped gym. There are other outbuildings that offer additional potential. The property is surrounded by its own grounds and includes an outdoor dining area, BBQ facilities and a hot tub / swimspa. A truly exceptional property. two with shower room, a family bathroom and a separate toilet. The second floor offers another exceptional double room. A large stone outbuilding has been converted into an additional leisure area including a bar / party area and a fully equipped gym. There are other outbuildings that offer additional potential. The property is surrounded by its own grounds and includes an outdoor dining area, BBQ facilities and a hot tub / swimspa. A truly exceptional property. two with shower room, a family bathroom and a separate toilet. The second floor offers another exceptional double room. A large stone outbuilding has been converted into an additional leisure area including a bar / party area and a fully equipped gym. There are other outbuildings that offer additional potential. The property is surrounded by its own grounds and includes an outdoor dining area, BBQ facilities and a hot tub / swimspa. A truly exceptional property. other outbuildings that offer additional potential. The property is surrounded by its own grounds and includes an outdoor dining area, BBQ facilities and a hot tub / swimspa. A truly exceptional property. other outbuildings that offer additional potential. The property is surrounded by its own grounds and includes an outdoor dining area, BBQ facilities and a hot tub / swimspa. A truly exceptional property.